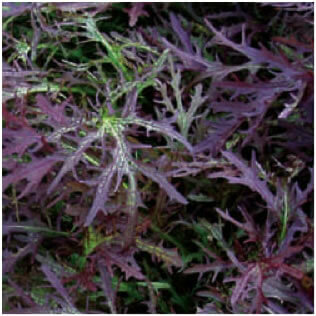 A wonderful frilly red mustard. Definitely one of my favourites. Very easy to grow with a mild flavour. Oriental mustards are starting to become very popular. They make an excellent addition to any salads and provide beautiful colour, shape and spice. 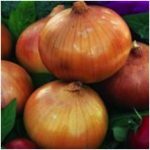 There is an ever increasing range of varieties available and their real advantage is that they are very hardy. They may be the only crop that will survive a harsh winter. In fact they are at their best if grown during the autumn, winter and spring months in a polytunnel or greenhouse. These are my favourites. The leaves are the most attractive leaves in a salad bowl. They are very finely serrated- more than you can imagine. There are three excellent varieties: ‘Red Frills’, ‘Green Frills’ and ‘Golden Streaks’. I highly recommend any of them. Oriental mustards do well in any reasonably fertile soil. The best time to sow oriental mustards for planting into the tunnel or greenhouse is in late August until early October. I usually sow 5-7 seeds in each module. The modular transplants are ready for planting out about 5 weeks after sowing. You can make more successional sowing from late January until April but they never perform as well as the autumn sowing. They are likely to bolt prematurely and also get attacked by the fleabeetle. Oriental mustards may suffer from all brassica diseases but the fleabeetles cause the most havoc. The symptoms are hundreds of tiny little ‘shotholes’ through the leaves that are caused by a tiny shiny black beetle that jumps off the leaves when disturbed. Only the autumn and late winter sowing will escape the fleabeetle. If you are determined to grow oriental mustards in spring and summer you will have to cover the beds as soon as they are planted with a fine netting such as fleece or a fine Enviromesh.